For this week's Image of the Week I went looking for colour! The problem was that on a very grey February day there was very little colour about! I hunted around the garden and found almost nothing. The crocus were all closed up, keeping their secrets safe inside! The daffodils hadn't arrived yet! Neither had the tulips, hyacinth or allium! The only flash of colour I initially found were from a few quince blooms, which were buried deep within their hedges! 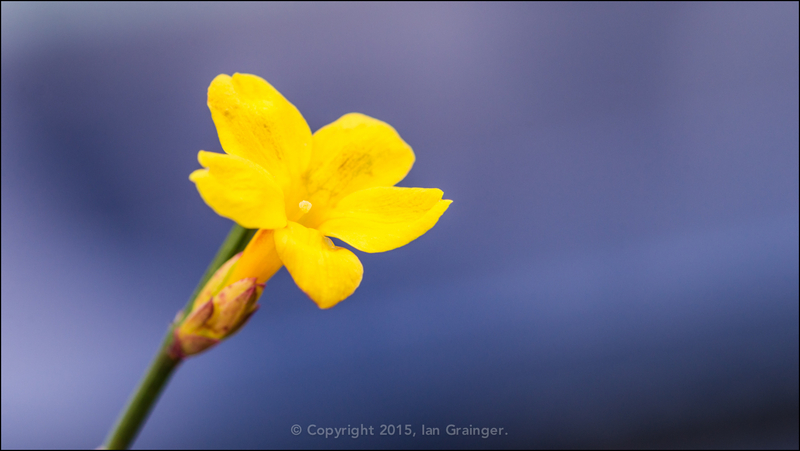 I then spied this pretty little Winter Jasmine bloom! However, it looked very drab in its hedgerow setting, and had a very messy background, that wouldn't have made the best of pictures! I decided to bring it into a more colourful and plain setting. The blue background is actually my car, which was parked next to the hedge! I think the complimentary colours work very well, and just go to show that if you look hard enough, you can grab a colourful image even on the dullest of days!